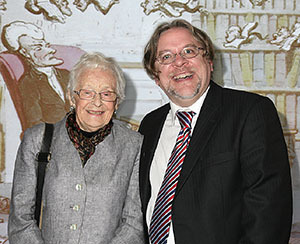 Mrs. Dorene Seltzer with Mark Purcell. This year’s Friends of Fisher lectures got off to a very entertaining start with Marc Purcell of the National Trust Libraries delivering this year’s John Seltzer and Mark Seltzer Memorial Lecture. 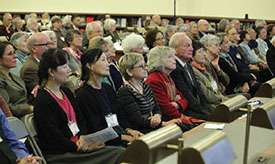 Purcell took the standing-room-only audience through a tour of the various National Trust Libraries in England, Wales and Northern Ireland. It was illuminating, and a great beginning to the lecture series. This exhibition, which opened on October 2, has been very well attended. It is the first major exhibition in North America on George Barbier, one of the great French illustrators of the early twentieth century. It features the extensive Toronto holdings of Barbier’s published illustrations drawn from the collections of the Library & Archives at the Royal Ontario Museum, Toronto Public Library Special Collections and the George Grant Collection at the Fisher Library. The exhibition is curated by ROM librarian Arthur Smith, who became fascinated with Barbier pochoirs in the mid-1990s when he encountered a volume of Falbalas et Fanfreluches while mounting a display of treasures from the ROM’s rare book collections. The exhibition continues to December 20. On October 29, Robert Wu, a Toronto-based designer bookbinder, gave an illustrated lecture on the process of creating a binding for an important French Art Deco masterpiece by George Barbier, which is included in the current exhibition. The binding was commissioned by the Fisher Library. 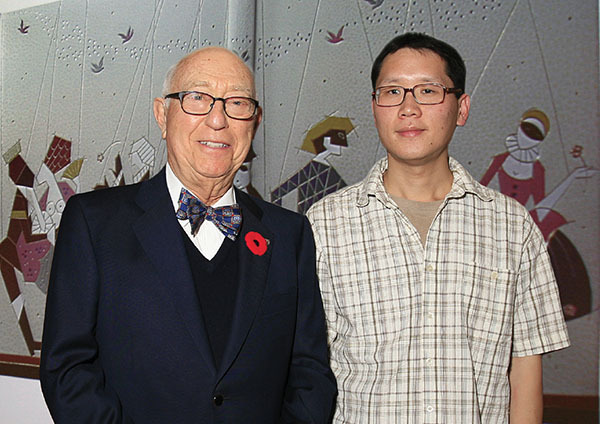 Robert Wu was educated as an architect both at the University of Toronto and at Ryerson University, but now works as a designer bookbinder and paper marbler. He trained and works in the French bookbinding tradition. On October 22, Michael Ignatieff gave a highly interesting talk on his most recent book, Fire and Ashes: Success and Failure in Politics. Ignatieff recounted his time in politics from the moment he was unofficially approached by Liberal power brokers to the moment he left office. The audience listened with rapt attention as Ignatieff gave a measured, scholarly and interesting reflection on such themes as the differences between the intellectual and political spheres, what causes politicians to be successful or unsuccessful and the role that ideas play in all of this. At the beginning, Ignatieff gave a reflective commentary on the importance of libraries and on the importance of UTL, noting various items in UTL’s collections and delighting the audience with his intimate knowledge of those collections, garnered from daily use of the library. Left: Michael Ignatieff. Right: Larry Alford, Sarah Thomas, Robert Blackburn (holding the Robarts Library ground-breaking shovel) and Carole Moore. On November 12, Sarah E. Thomas, Vice President for the Harvard Library and Roy E. Larsen Librarian for the Faculty of Arts and Sciences, presented the lecture Horseless Carriages and Hybrids: Describing the Library in the Era of the E-book and Big Data. Larry Alford, current UTL Chief Librarian, and past UTL Chief Librarians, Robert Blackburn (1954–1981) and Carole Moore (1986–2011) delivered preliminary remarks. Larry spoke about various new and far-reaching partnership initiatives in which UTL is currently engaged. Dr. Blackburn reflected on the expansion of UTL initiatives and buildings during his time at the helm, and Carole Moore discussed the audacious vision that made UTL into one of the top three academic libraries in North America, and the revitalization and renovation of the UTL buildings undertaken in the 1990s and 2000s. Sarah Thomas then gave a well-received visual tour of libraries and their transformation in the twenty-first century. One example given was how important partnerships will become. She used the case of Queen Victoria’s Journals which previously were only available at Windsor Castle. With a partnership among Proquest, Windsor Castle and the Bodleian Library the journals were scanned and made publicly available in time to celebrate the Queen’s Jubilee. On October 24, the President’s Circle reception and lecture was held in the Gerstein Science Information Centre in the magnificent Gerstein Reading Room. The speakers were Larry Alford, Chief Librarian, and Anne Dondertman, Associate Librarian for Special Collections and Director, Thomas Fisher Rare Book Library. Each addressed the question “We’ve Got the Internet–Who Needs Libraries? ", exploring the idea that, in a digital age when information is available at the click of a mouse, the academic library, as a laboratory of innovation, driver of collaboration and keeper of the cultural and historic record, is more relevant than ever. 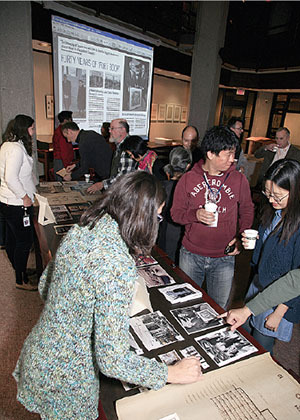 Library staff examine photos and documents chronicling Robarts Library’s history. On October 23, over 100 former and current members of staff gathered to share cake, conversation and memories, marking the fortieth anniversary of the opening of the John P. Robarts Research Library. When it officially opened its doors to the public in July 1973, Robarts Library was the largest university library building in the world and second largest in terms of holdings in North America. Larry P. Alford, Chief Librarian, began the remarks by congratulating all staff, present and past, for their dedicated work throughout the decades. Speaking on the theme “I was there when…” three current members of staff shared their forty year stories. Gordon Grigor (hired 1972) Terry Correia (1973) and Darlene Kent (1971) spoke about the Library as it was when they moved in. Following the speeches, they joined in cutting the celebratory cake with the assistance of Larry Alford and retired member of staff, Ralph Peterson (1965). For more information about the history of Robarts Library visit http://heritage.utoronto.ca/exhibits/robarts-library to view Forty Years of ‘Fort Book’: The Story of Robarts Library Online.